Bittersweet In Grand Ravin | HURAH! Esterne Bruner, 38, non-violent champion of Justice, Grand Ravine, shot 9/21/06, R.I.P. On Oct. 18 2007, the “Jacques Roumain” High School (high on the hill) was opened with 1300 enrolled. 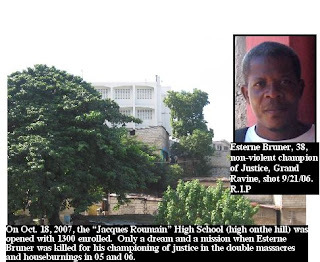 Only a dream and a mission when Esterne Bruner was killed for his championing of justice in the double massacres and houseburnings in 05 and 06. Caption for second picture: These happy high school students now have a public school thanks to the constant lobbying of AUMOHD and it’s Community Human Rights Council (CHRC) in Grand Ravine. It was impossible for me to be morbid and teary-eyed today as I went back to the scene of such bloody, burned out homes, and terrifying out of control police and the interim government back on Aug. 25, 2005. That was when Atty. Evel Fanfan gathered victims and families of the first “soccer” massacre at the high school without a name ransacked shortly after Pres. Aristide was kidnapped. What a beautiful white three story building shining in the sun, but stripped of every piece of furniture and closed to the community which had planned on sending their children to a public school, planned and built by the Aristide government in 2003. On that August day in 2005 I was touring the school with one of the American UN policemen when a shout rang out that the police were on their way. The dreaded Haitian National Police! They who had orchestrated the massacre of some 50 people in broad daylight at the St. Bernadette soccer stadium down the hill in the sprawling poor community of Martissant were marching toward where we were. Our American UN policeman gathered everyone–some 30 people only 4 days previously subjected to machete-wielding hackers and police guns–in the basement. He pledged along with his sole mates (1 other policemand and two investigators) to put their bodies on the line at the gate of the school and do whatever was necessary to stop the police from advancing on these people. It was a moment of true valor never to be forgotten. But today I wasn’t feeling badly. I couldn’t. The shiny white school was teaming with some 800 students (another 500 cannot be accomodated for lack of electricity in the late afternoon session) all smiling and full of life, clearly ecstatic and fully occupied with their schooling. 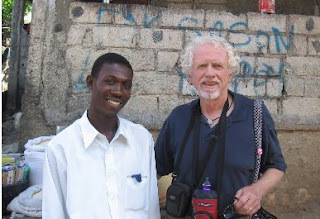 The picture of me and Franzko, the young man who has replaced Esterne Bruner as the coordinator of the Grand Ravine CHRC, shows us standing in the exact spot where I stood with “Bruner” on Sept. 2, 2006, just a couple of weeks before he was brutally murdered. The chief of the murderous gang, The Little Machete Army, Roody Kernizan, has committed suicide and his wife is in jail. Several others have been killed in confrontations with the police. This kind of justice is not what we have wanted and not what we are looking for in the future as we press for reparations and convictions of the remaining killers. After meeting with the school administrators and visiting classes we went to visit the mother of Esterne Bruner, a gentle and beautiful and dignified octogenarian. And then we went to a meeting of the Grand Ravine Community Human Rights Council (CHRC), some 50 people in attendance. This is the second CHRC established by AUMOHD to be an ennabling force among communities so deprived of human rights as these inner city communities are. There a lively discussion of what was still undone by the authorities, the court case to put those officials responsible for the first massacre on trial, to put the murderers and house burners of the second massacre in July 06 on trial. Even though the chief of the most flagrant band of killers, Roody Kernizan, has committed suicide and his wife is in jail, there are many others including 15 police free on the streets. Some deal has been made behind the scenes according to AUMOHD President Fanfan to forget about these cases, but the CHRC is adamant that they go ahead with the cases nonetheless. They also set up a delegation to visit the city water commission this afternoon to pressure them to take measures to clean up the water after the Noël flooding. These folks are a model of community organizing at its best. They are passionate in their discussions and yet respectful to the utmost of each other’s opinions. Decisions are made by consensus. By the way the Aristide high school has been named, the “Jacques Romain” High School. Romain was a great intellectual and a Marxist! 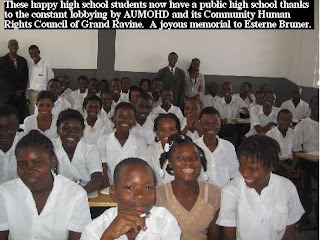 We think though–the Grand Ravine CHRC and AUMOHD– the school should be named the “Esterne Bruner Memorial High School”. At least we’re going to present a plaque saying as much to the authorities. Also we want to do something about the total lack of electricity–help us with gathering money and expertise for a solar system–to accommodate an afternoon session and to pump water to the bathrooms and kitchen. A small detail left out by the USAID, UNICEF, and OIM grants. It has been a glorious day.